Home care services for elders offer the personal, medical, and social care needed for loved ones. If you’re considering a home care service for a family member, there are some questions you should consider in order to determine if it’s the right solution for your needs. Understanding the benefits of home care services and knowing what questions to ask helps you choose the right service provider. You’ll have peace of mind in knowing that your loved one’s needs are being met and their health is in good hands. What are the Benefits of Home Care Service? 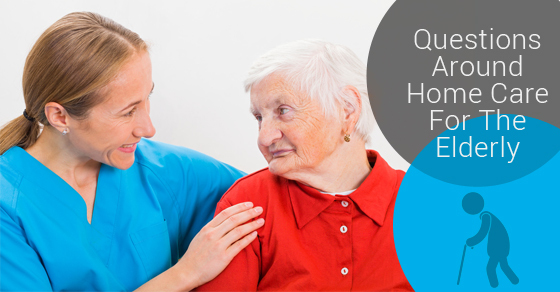 Home care services can provide a great deal of comfort and ease to all members of the family. A home care service provider allows an individual to remain in the comfort of their own home for a longer period of time. Relocating to a healthcare facility can be difficult for many patients and cause feelings of anger and resentment. Receiving care at home provides a safe and familiar environment while ensuring that their health needs are being met. Home care allows friends and family to stay in close contact with an elder. Familiar neighbors are close by, creating a more stable and consistent environment for the patient. Home care services are flexible and can meet your scheduling and budgetary needs. Service providers are qualified and their agencies offer ongoing support to answer any questions you may have. Will Other Medical Issues Influence Home Care Service? If an elder has pre-existing medical conditions that require additional care, a home care service provider can offer the support they need. Health conditions can become more severe with time. A home care specialist is trained to address health issues and collaborate with other health professionals when needed. If mobility is an issue for a patient, the home care provider can assist them in moving around and handling many of the basic functions of daily life. If complications arise, they can provide the treatments and care needed. What Should I Ask When Interviewing a Home Care Service Provider? Finding the right home care specialist is critical to providing the right care and achieving the peace of mind you need. The best way to do this is to research different candidates before deciding who to hire. You should provide as much information related to the condition of the patient and any tasks that need to be completed on a daily basis. A service provider must be able to offer the services you need without any concerns. References are also especially useful when choosing an individual to care for your loved one. It would also be wise to consider each applicant’s previous experience and training, and inform yourself on the industry standards so you know what to look for. These questions help you determine whether home care is an ideal solution for the care of an elder. Understanding the benefits that the service provides and how any pre-existing medical issues can be considered makes the process easier for you and your family.